Made between 1983 to 1987. It has a amazing viewfinder which is big and bright. Both the light meter info and the focus aid system is very easy to use. Left side has all the shutter speeds between 1/4000s to 8s and a needle shows the light meter info. There is also a transparent green marker showing which shutter or shutter setting is selected. In the top middle you can see which aperture is selected on the lens. All metal body and really well built. This can be found with chrome or all black as the one I have. Both of these are great looking cameras but I prefer the chrome ver between these two. 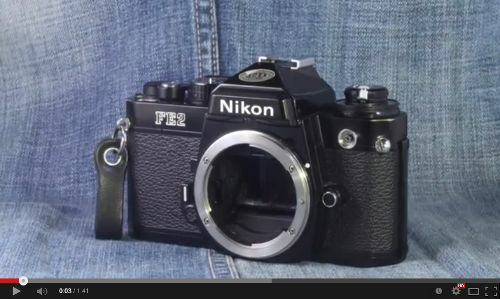 Also like many Nikon SLRs it also have a very good feel. Shutter and mirror nois are not too bad for this type of SLR. It is a SLR that has more or less everything one might need. The auto shutter is one of the best I've ever used. It is stepless so you can get very precis exposure plus can give shutter speeds that apparently can be hours long. This can be very useful for night photography and many SLRs light meter would fail at this completely. However the self-timer and lock shutter lever are combined and you can't use them both at the same time. Would have been nice if you could take a reading, lock it, compose you frame and then use the self-timer so you can remove your hands before the exposure starts. But in cases like this the exposure comp can be handy. Another thing is the removed support for non ai lenses. 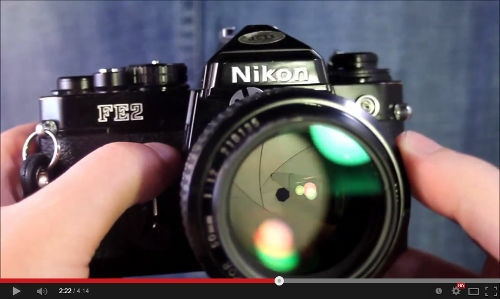 This is something the first Nikon FE had. Most users will probably not miss this but for some this can however be a big problem. This camera also feel very good in your hands and buttons and levers are well placed. Well in short this is a amazing camera. It's really well built and reliable. Has a good size and fairly light weight. The titanium bladed shutter gives really good and precise exposure and should work just as good in really hot or cold weather. I have used my copy for hours in temperatures under -10c without any problem.